This is a screamin’ deal! Mix and monitor with your bandmates without bothering the neighbors. This limited-time bundle (November 2016) is available to customers in the USA only from shop.presonus.com. 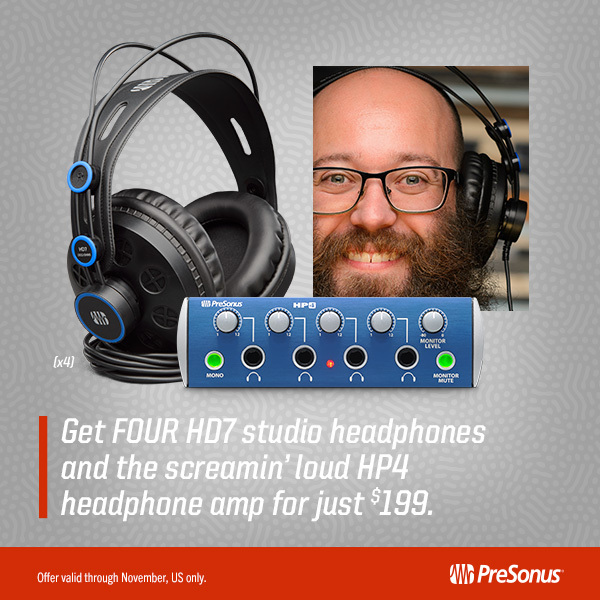 You get the whole bundle for a mere $199, which is less than the cost of the four sets of headphones without the HP4 amp on any other month out of the year. The headphones are comfortable for long mix sessions and sound great, and the HP4 allows for stereo or mono listening, with individual volume levels available for each set of headphones connected. The HP4 gets PLENTY loud, too (be careful!) so it’s also a great choice for drummers who need to hear the mix over the clang of their Lars Ulrich Signature Series Diamond Plate Steel Snare Drum. Click here to get your HP4/HD7 monitoring bundle!